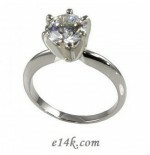 Russian CZ in Solid 14K Gold Traditional 6-prong Solitaire Ring. Unbelievable Price!! Available in a variety of Russian CZ Stone sizes. Russian Cubic Zirconia's are more precisely cut & polished of the best CZ quality available... (Available in 14k White Gold, 14k Yellow gold, and Platinum). This diamond grade mounting can be set with one of our High quality Round Brilliant Russian CZs or order "blank" for your diamond! This item is typically instock and take 2-5 days, however, if it is out of stock it will take 7-10 business days. Available in other sizes & shapes by special order.